There may be no better place to hook into Florida’s most popular game fish than Tampa Bay. New passions are discovered and personal records are broken in these waters year after year, by first-time anglers and seasoned pros alike. 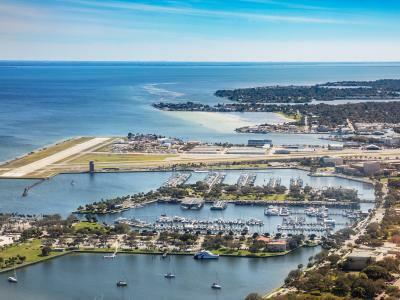 With no shortage of Redfish, Snook, and 100+ lb Tarpon swimming around here, the question isn’t why you should try fishing in Tampa Bay—it’s why wouldn’t you? 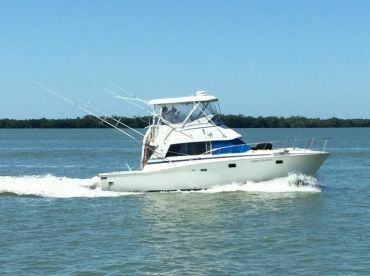 You’ll find Tampa Bay fishing charters all over the place, in Tampa, St Petersburg, St Pete Beach, Clearwater, Bradenton, Sarasota, and almost everywhere in between. Whether you’re in the market for a quick run to the flats or a long trek offshore, there’s a trip to suit your interests and plenty of prized game fish to go with it. 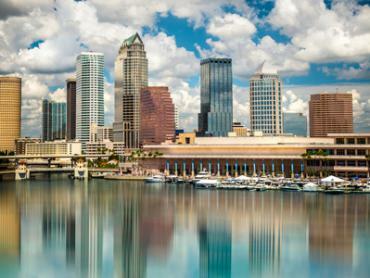 Simply put, Tampa Bay is 400 square miles of shallow saltwater habitat. On average, the Bay is roughly 12 feet deep, reaching no more than 82 feet at the deepest. Add to that an abundance of grass flats, mangroves, oyster bars, passes, jetties, and docks—and you’ve got a recipe for some serious light tackle action. Anglers here have honed a variety of techniques that are just as diverse as the fishing grounds themselves, including fly fishing, flounder gigging, and bowfishing. More than 200 species of fish live in Tampa Bay, and it’s not uncommon to reel in dozens of them on a single trip. At the top of any respectable angler’s list are Tarpon, Redfish, Snook, and Speckled Trout (not necessarily in that order). You’re likely to catch tons of other fish, as well, including Black Drum, Sheepshead, Pompano, Flounder, and a variety of Sharks. Tampa Bay boasts excellent fishing all year. There’s almost never a bad time or place to hunt down Redfish and Speckled Trout. You’ll find these fish in water as shallow as 3 feet on most days. In cooler months, they head away from the flats to deeper water. 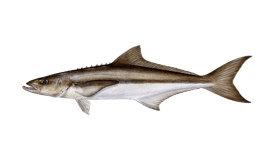 Snook also inhabit the bay year-round, but can be quite tricky to seduce in winter. For the best results, target this fish in spring and summer. 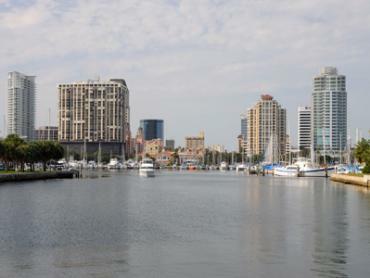 When it comes to this prize, good fishing spots in Tampa Bay include beaches, mangrove shorelines, and docks. 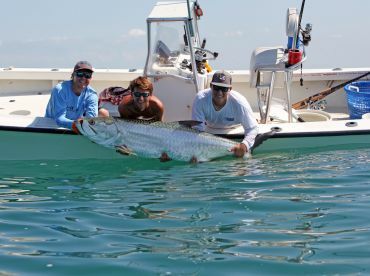 The crown jewel of a Tampa Bay fishing experience is Tarpon. You can expect to catch the Silver King here between April and August, or as late as October in some years. Some of the largest specimens (80-150 lbs) show up from May through July, but late summer offers multiple hook-ups. On a good year, the Tarpon season in Tampa Bay lasts for 7-8 months—enough to rival the action in Boca Grande. Anglers who are eager to hone their skills before chasing trophy fish in the Bay can find plenty of practice on the local piers. It’s not uncommon to catch Snook, Cobia, Redfish, and even Blacktip Sharks without leaving dry land. Some of the most productive Tampa Bay fishing piers include Redington Long Pier at North Redington Beach and the Big 60 pier in Clearwater. When you’ve had your fill of inshore fishing (as if! ), set your sights on the Gulf of Mexico. 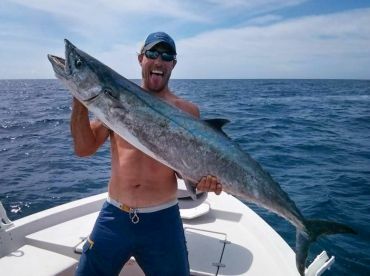 This massive offshore fishery just beyond Tampa Bay offers excellent bottom fishing and a chance to catch big game prizes such as Mahi Mahi, Barracuda, and King Mackerel in summer. Bear in mind that some Snapper and Grouper species are not always legal to keep, depending on regulations. 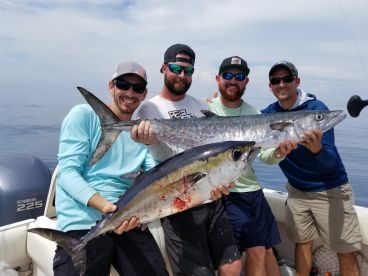 A deep sea fishing trip will take you past Florida state waters, possibly as far as 60-100 miles offshore where Tuna, Sailfish, and other massive pelagic fish roam. Most offshore fishing charters in the Tampa Bay area leave from Clearwater and St Petersburg. You can expect to spend 8-12 hours on the water if you plan on deep sea fishing. You can catch almost any species in Tampa Bay on light tackle. Depending on the species and various conditions, anglers rely on a variety of methods from spinning, baitcasting, trolling, and drift fishing to bottom fishing. Live bait like Minnows, Shrimp, Pinfish, and Crab are extremely effective. Lures such as surface plugs, jerk plugs, and swimming plugs will also get the job done. Fly anglers can indulge in just as many opportunities, landing no shortage of species using a 10-12 weight fly rod. Bucktail and scissor-action feather streamers work well for Tarpon, whereas Redfish and Snook are partial to poppers and large streamers. Bowfishing is becoming ever more popular on the flats of Tampa Bay. This unique blend of angling and archery is easy to learn and makes fishing for Mullet, Flounder, Sheepshead, Mangrove Snapper, and Rays all the more exciting. Bowfishing is best at night, when there’s enough action for you to make as many as 100 shots. Beginners can expect good success after getting in a few practice shots at the beginning of the trip. 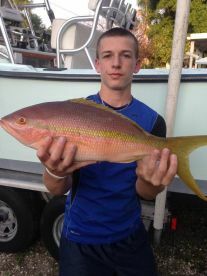 Most Tampa Bay fishing charters provide a fishing license for their customers. If you plan on fishing by yourself, be sure to purchase a Florida fishing license ahead of time. Anglers are allowed to catch and release fish in Tampa Bay year-round. Some species have size and bag limits, so be sure to check local regulations if you plan on keeping your catch. Fishing with a guide is the best way to fish responsibly. 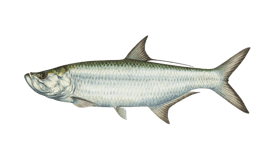 Tarpon fishing is strictly catch and release in Florida, unless you’re aiming to beat the IGFA record. 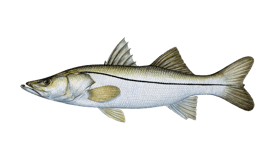 Snook fishing is limited to catch and release for much of the year, except for a couple of months when it’s legal to keep this fish (the open season changes every year). You must buy a special permit if you plan on keeping this species. Early in the year you can expect excellent fishing if you know where to look! Average temperatures range from 52-70°F, cold enough to push Redfish and Speckled Trout into the deeper water of the bay. February is full of possibilities here in Tampa Bay. 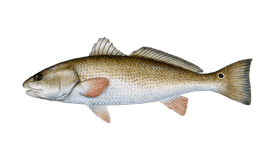 Fishing inshore could produce anything from Redfish, Speckled Trout, and Sheepshead to small Sharks. As average temperatures climb toward 76°F, things are heating up on the flats. 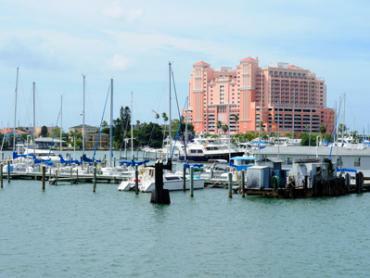 Charter boats in St Petersburg and Clearwater are gearing up for the season offshore. Tampa Bay will be bustling with anglers by April, as Tarpon make their entrance and Snook regain their appetite. Light tackle and fly fishermen can have a blast on the flats. The offshore fishing season is up and running. With average temperatures ranging from 70-87°F, it’s hard to say what’s hotter out here: the weather or the fishing! Tarpon season is in full swing, with top notch Snook fishing to boot. You’ll be spoiled for choice in June, with unparalleled fishing on the flats and in the Gulf. Why choose when you can spend one day wrestling Tarpon inshore and the next reeling in Wahoo offshore? You can expect some of the hottest weather of the year in July, with average temperatures soaring to 90°F on some days. Cool off on the water and reel in some prestigious game fish while you’re at it! The summer heat continues, along with stellar fishing left and right. You can expect multiple hook-ups while Tarpon fishing and a wide variety of catches on the flats. These warm summer nights are perfect for bowfishing. In some years, fantastic fishing continues all the way through September. Tarpon and Snook are still in the cards, along with a variety of big game fish offshore. Average temperatures are slipping below 90°F. If you’re lucky, the Tarpon fishing in Tampa Bay could still be strong at this time of year. The flats offer plenty of light tackle and fly action. Cast a few lines before a cold front pushes the fish into deeper water. 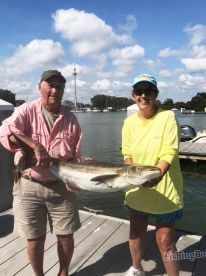 The offshore fishing season comes to a close in November, but this can be the perfect time to check out the busy waters inshore. With fewer tourists in the Bay, you can have this fishery all to yourself! Even in December, you can expect balmy weather ranging from 54-72°F. Fishing the deeper water in the bay will yield Redfish, Speckled Trout, and the odd Snook.